This morning, less than 48 hours removed from his defense of the little guy, the President gave a speech in Nevada during which he championed…H.R. 1380, the New Alternative Transportation to Give Americans Solutions Act (a.k.a., the NAT GAS Act, a.k.a., “The T. Boone Pickens Earmark Bill,” a.k.a., the “Pickens-Your-Pocket Boondoggle Bill”), legislation that was manufactured by billionaire T. Boone Pickens in order to make himself even richer. The bill would subsidize the use of natural gas as a fuel for the transportation sector, in particular for the trucking industry. Pickens is a gas tycoon, and it goes without saying that legislation to increase demand for gas is good for his bottom line. 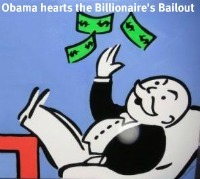 By throwing his weight behind this Billionaire’s Bailout, President Obama exposed the vapidity of his SOTU commitment to an America where “everyone plays by the same rules.” The NAT GAS Act was written by billionaires, for billionaires. Should we really care that a billionaire is pushing for the US to become less dependant on foreign oil and ultilize it’s own resources in which we have too much of and is at an all time low price. Natural gas to fuel the trucking and transportation indusdry, geat idea at less than half the price of disel. Do we really care that Pickens might make a little money off this plan while we put more Americans to work and save over a half a trillion per year. Obama is right, we need to get this done and the sooner the better. Bill 1380 makes total sense. There are untold billions which will be saved because we will not have to spend money defending the barrels of oil we get from unstable places. This bill is a game changer for the United States. Pickens makes some money but so do 100 of thousands of middle class people who will get high paying jobs. And, using nat gas as a transportation fuel it pollutes less too. What do you need most – clean water or natural gas? That may be the choice we are making as we look at hydraulic fracturing. Next post: Did GM and Feds Collude to Hide Green Car Battery Fires?